As powerful as a wildfire, as flammable as gasoline, The Smokin’ Betties are lighting up the Pittsburgh burlesque scene with their eclectic talents and salute to the female form. Their shows have a little bit for everyone, from vaudeville burlesque to modern teases, with each ember bringing her own spark to the stage. 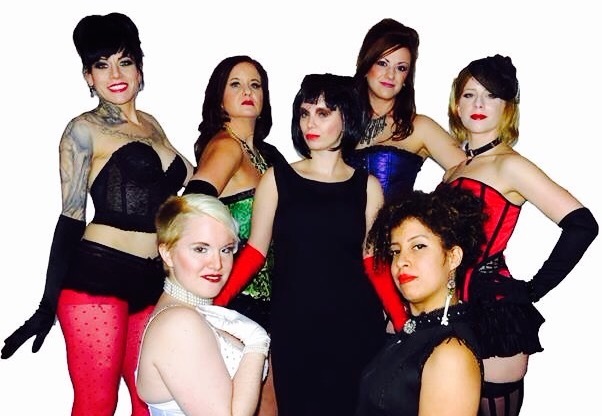 Trained under the Steel City’s award-winning, internationally renown Madame of Sideshow and Burlesque, Macabre Noir, these firecrackers are available for shows, public events, and private venue performances. And for juicy Betties gossip, subscribe or check back here! We are so proud to announce that our last show was another smash! Read more about it and see some photos in our latest blog post. Many many thanks are due to our wonderful and supportive audience who’ve either come out to our shows to cheer us on through the night, or reached out to us on social media to keep us informed and entertained. We are nothing without you! We’d also like to extend a special thanks to our friends at Steel City Burlesque Academy for teaching us everything we know, and Most Wanted Fine Art for providing us the space to learn. And of course we wouldn’t forget the local organizations who’ve given us that little extra push when we needed it most: BOLDPittsburgh (an e-zine that features all the fun of the ‘Burgh in one place), Club Cafe for being such a doting and supportive host venue, Dark Designs Photography for providing the stunning photos of our last show, the JCCP Rocky Horror shadowcast, Kabarett Vulgare sideshow troupe, Pittsburgh Podcast Network, RedHorse Radio, Sassy Sensations Adult Toy Store, and the innumerable people who’ve lent a helping hand or a word of wisdom. Thank you!